Using the below query we can convert the rows to column sperated by a delimiter. In the query I am using ';' as the delimiter and you can change the delimiter of your choice by replacing ';'. Microsoft SQL Server 2012 RC0 enables a cloud-ready information platform that will help organizations unlock breakthrough insights across the organization as well as quickly build solutions and extend data across on-premises and public cloud backed by capabilities for mission critical confidence. To read more and download Microsoft SQL Server 2012 RC0 click here. Consider you are giver a task of gathering information from multiple servers. What are the different ways you can automate this? Create one SSIS package with multiple data sources and duplicate the tasks for each data source. 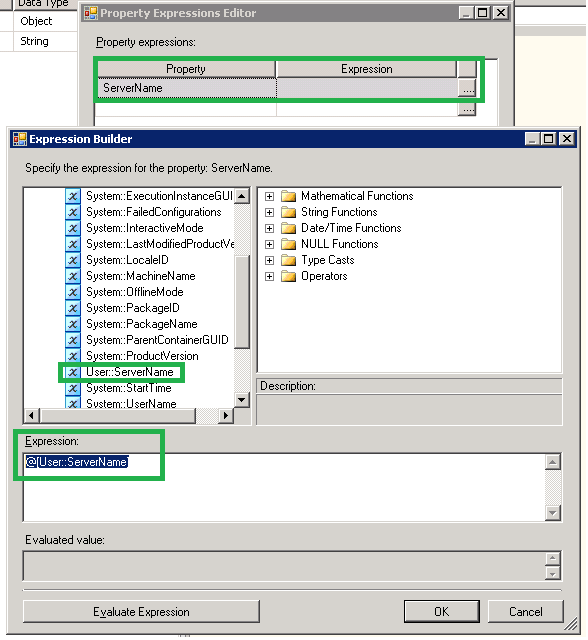 Create one SSIS package which dynamically builds connection to each server and does the data loading tasks. If you choose an option between 1 and 3 , then you will have to do some extra work for gathering the server information when there are new servers added to your environment. If you choose the 4th option then also you will have some extra work but it is very small and easy when compared to the first 3 options. Here you need to just add the new Server Names to the table and that is all and everything else will be taken care by the SSIS package. 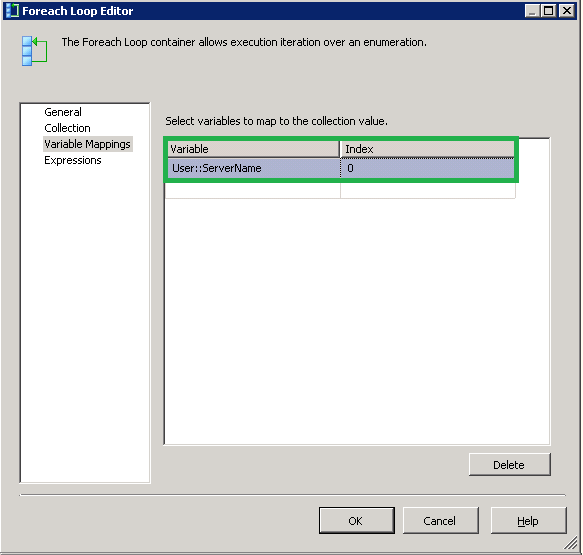 In this post I am going to explain how to create a SSIS package which loops through multiple SQL server and gathers information by building the connection to those servers dynamically. 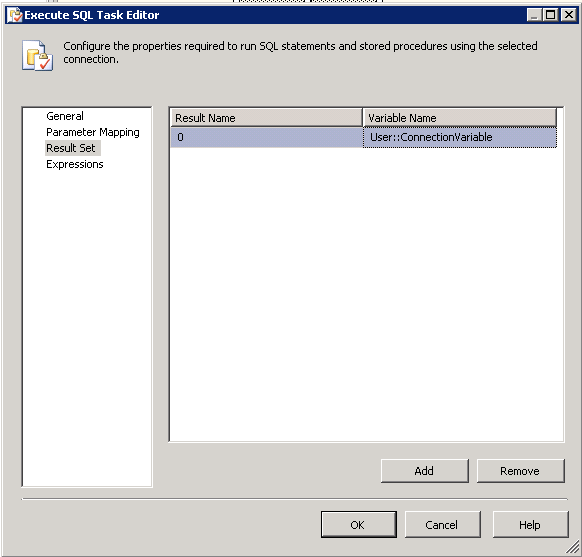 Add an "Execute SQL Task" with SQL Statement like "select FullName from dba..tbl_ListOfServers". Set the result set to Full Result Set. Set Result Name "0" and assign it to your Object variable (In our case it is “ConnectionVariable”). 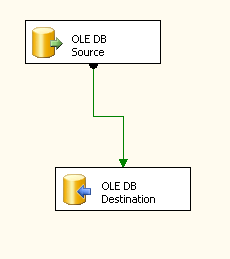 Now, in the “Data Flow Task” add a “OLE DB Source” (Dynamic Connection) and connect it down to a “OLE DB Destination” (which will be your Central Repository). Now Select the Source Connection Manager (In Our Case it is “Source”) and Right-Click on this Source and choose “Properties”. 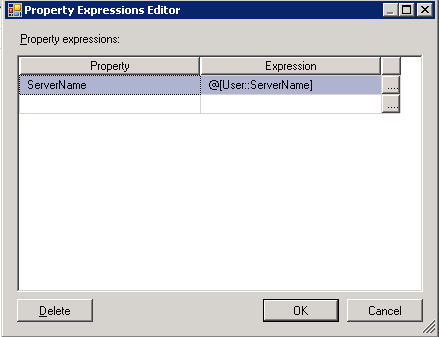 Now in the “Property Expression Editor”, Choose the property “ServerName” and click on browse button (…). Now choose the String Variable (in our case “ServerName”) and Drag and Drop this variable into the “Expression” box and click “OK” and “OK”. 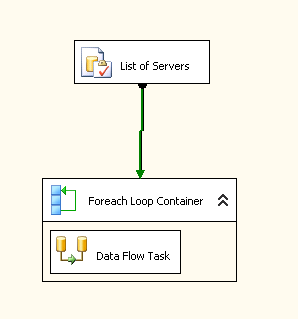 Now when the package runs, the “Execute SQL Task” will read the list of servers and stored in the table you specified and the “Foreach loop” will iterate over each record in that table, running the “Data Flow Task” each time while each time, the ServerName property of the Source Connection in the data flow will get a new value. DBA's are required to watch the space usage of database files in order to take preventive measures of future failures with respect to database full issues. This will be usually required when there is a bulk activity happening on a database. 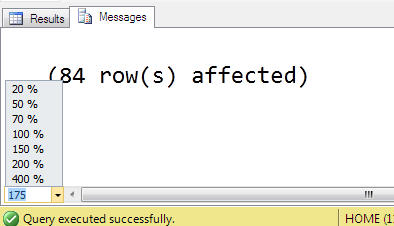 To do this make use of the below stored procedure. Create this SP in a database and execute it in regular intervals to get the latest status of the database files. This can be used to view the space usage of all the database files or for a particular threshold value. /* -- Enable this Content if you want to send email. 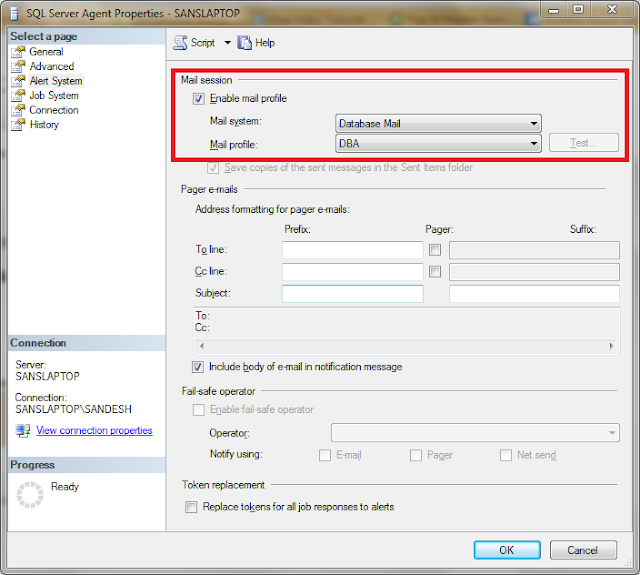 Configure Database Mail option. To configure Database mail option, follow this post. Uncomment the below content in the SP. If you specify the @Threshold=0 then, this SP will give space usage details of all the database files. If you specify the @Threshold=80 then, this SP will give space usage details of those database files which exceeds the threshold 80 percent. Here is the query which can be used for getting the list of Indexed views in a Database. Are you migrating your SQL Servers? Here is a quick checklist for your SQL Server Migration. This is to ensure that the no applications are connected to the Databases during the migration process. Change the Properties of the databases that are part of Migration to "Read-only". This is to ensure that the data modification is not happening by any other sources. Take a FULL backup of all the User databases that are involved in the Migration Process. Move the backups to the destination server or a Shared location, then restore them to the appropriate drives on the destination. 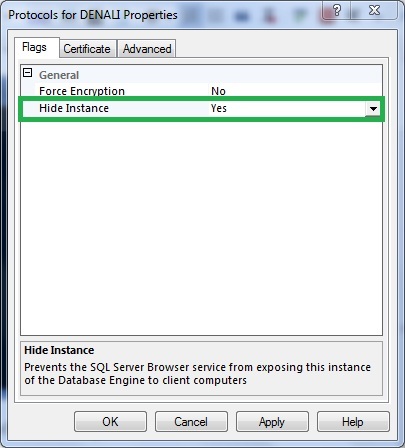 Do this if the applications connecting to these databases are independent of the database compatibility level. Transfer logins using SSIS (Transfer Logins Task) or using "sp_help_revlogin"
Some times you may find that the SQL Server Service is not starting after applying a service pack and when you check in the Event Viewer you find the below message. 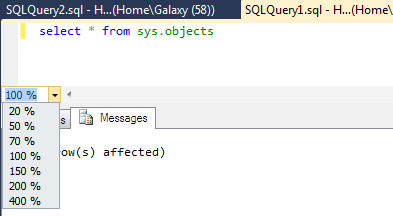 Script level upgrade for database 'master' failed because upgrade step 'sqlagent100_msdb_upgrade.sql' encountered error 598, state 1, severity 25. This is a serious error condition which might interfere with regular operation and the database will be taken offline. If the error happened during upgrade of the 'master' database, it will prevent the entire SQL Server instance from starting. Examine the previous errorlog entries for errors, take the appropriate corrective actions and re-start the database so that the script upgrade steps run to completion. 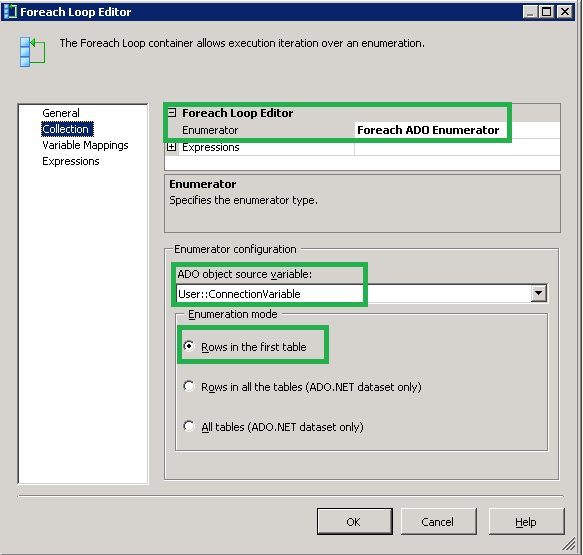 SQL Server Setup creates a database with the data file name temp_MS_AgentSigningCertificate_Database.mdf during the installation process and if the SQL Server setup is not able to create that database in the default data path then the above error is returned as it is not able to find the path. Go to Registry editor, To open this, go to "Run" and type "regedit" and click "ok"
First go to this path and make sure that the path in the key SQLDataRoot exists. If not then give a valid path to this key. Then go to this path and make sure that the path in the keys "BackupDirectory", "DefaultData" and "DefaultLog" exists. If not then give a valid path to these keys. Now you should be able to start the SQL Server Service without any issues. Once the Service is started, verify the SQL Server, databases and others to make sure everything is fine. Also verify if the Service pack or the CU is installed correctly. 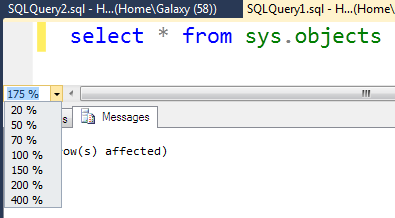 There will be many different messages that will be logged in the Error Log of SQL Server. Among them you might also find the below message some times. This is the most common message that will be logged when there is no "Mail Session" defined for the SQL Server Agent Alert System. 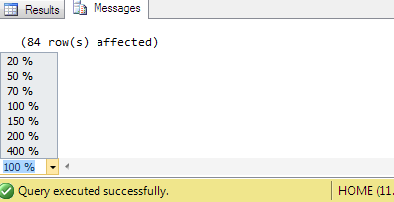 To Fix this or to make this message disappear in the Error Log, you have to enable "Mail Session" and re-start the SQL Server Agent. Right Click on the "SQL Server Agent" and go to "Properties"
Now if you again look into the Error Log you will not find this message anymore after re-starting the Agent Service. 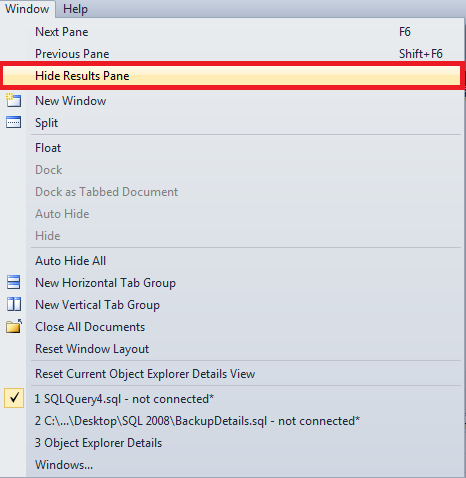 SQL Server 2011 comes with lots of new features and here is one such new feature. 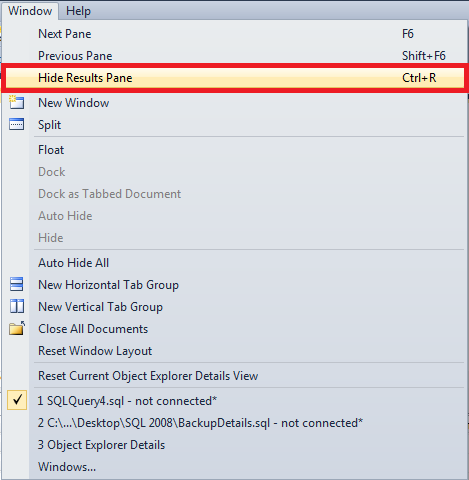 SQL Server 2011 has introduced zooming of Query window and results pane. Here is a T-SQL Query that I have developed to get the status of the SQL Server Protocols. This query reads data from the registry. Download this script from here.